Heaney describes an age-old process, its material and its product. A parallel is suggested: the composition of a poem is as complex and demanding of energy, skill and commitment as the practice being described. In Ireland súgán is a kind of straw rope with a variety of uses from farmyard twine to furniture seating. Heaney’s poem follows the traditional twining method. The poet himself, working on the family farm is fully engaged in the process. The jumble of soft raw material is set in a series of sibilants (the fluster of that soft supply) and the gentle dexterity required to unravel it velar plosives (coax () it from the ruck) and feed it into the twining machine. 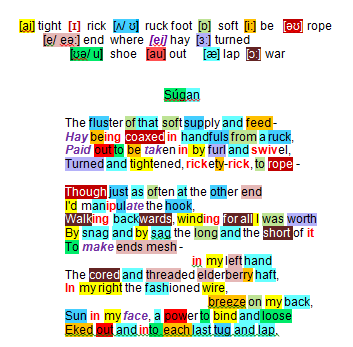 Heaney uses alliterative groupings to convey the mechanics (furl and swivel, turned and tightened), automated sound (rickety-rick) all part of the process of to producing Súgán (rope). At the assembly end of the process Heaney has a much more physical role, moving to and fro (walking backwards), engaged in hectic manual activity (winding for all I was worth) overcoming short-term hitches (by snag and by sag) ensuring the length and and continuity of the joints (the long and the short of it to make ends mesh) – a two-handed task, with winder in one hand and the finished product, much stronger now ( fashioned wire) in the other. The lyrical picture Heaney paints is of a time gone by: a healthy outdoor activity (breeze on my back, sun in my face) that developed fitness and endurance as well as demanding a deft touch and hard work: power to bind and loose eked out and into each last tug and lap – a metaphor for writing poetry if ever there was one.